I was anxious to learn how to make a carrot bread recipe when I first heard about it. It is not something that I made when I was young; actually I did not use carrots in any sweets like muffins, cakes, etc. The carrot was a vegetable and that was that; plain and simple. For that matter, it was one that I really did not like when cooked. It was probably in the late 1960’s before I realized that carrots were being cooked in sweet things like quick breads and cakes. By this time, people were starting to eat out more in restaurants. Occasionally, we would go out for dinner after church on Sunday. 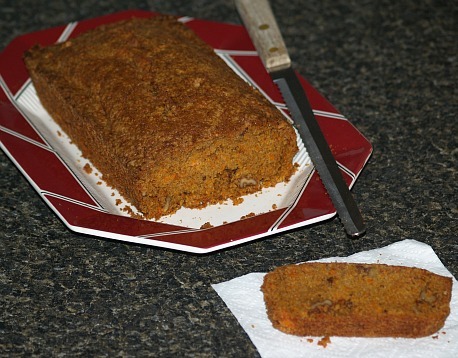 Many restaurants learned how to make a carrot bread recipe and offered it along with carrot cake on the menu. Honestly, I couldn’t tell any difference only that the bread was baked in a loaf pan. Both usually had a glaze or icing on the top and both were absolutely delicious. Later on most called this dessert only by the name cake and all started having that luscious cream cheese frosting. This is why I really wanted to learn how to make a carrot bread recipe or carrot muffins without any frosting at all. They are so moist and delicious you do not need any icing. If I want anything sweeter, I just add raisins or a little fruit to the recipe. In some countries the carrot bread recipe has been made for centuries. Often recipes come about as necessity; when there is a shortage of one ingredient and a large supply of another which can make up for the short one. This is the case with the carrot bread. Carrots have a lot of natural sugar in them and at this time there was a shortage of sweeteners like sugar. By adding the carrots, a sweet bread resulted which otherwise would not have been sweet at all. Not only did the carrot bread recipe become sweeter but they found the breads to be more moist and flavorful with the carrots. Combine the flour, cinnamon, soda and sugar in a large mixing bowl. Add the eggs, oil and carrots. Mix until well blended. Fold in the chopped pecans. Pour CARROT CAKE RECIPE into a greased loaf pan and bake for 55 minutes or until pick comes out clean. Cook carrots until soft; drain reserving ¼ cup of the liquid. Combine carrots, reserved liquid, orange peel, cinnamon and nutmeg in processor. Combine and stir together in mixing bowl flour, baking powder, soda and salt. In large mixing bowl cream butter and sugar until light and fluffy; beat in eggs and vanilla. Stir carrot mixture into creamed mixture; add flour mixture and blend well. Fold in raisins; spoon batter into 2 greased loaf pans. Bake at 350F degrees for 35 to 40 minutes; cool 10 minutes and remove from pans. This carrot bread recipe is a little different from others; the sweetness comes from the carrots and a little honey. Sift flour, baking powder and salt together into bowl; mix in cornmeal with a fork. Beat eggs in another large bowl until light; beat in the honey. Add melted butter and cream; stir in the carrots. Add the flour cornmeal mixture and blend thoroughly. Grease a cast iron skillet and briefly heat it in the hot oven. Pour batter into hot skillet and bake for 30 minutes or until center is firm. Combine sugar, flour, cinnamon, soda and salt in large bowl; stir to blend. Add coconut, raisins, carrots, apples and pecans; stir well. Add eggs, oil and vanilla; stir only until blended. Spoon into paper lined muffin tins; bake at 375F degrees for 20 minutes. Blend together oil and honey in large bowl; stir in milk, eggs, orange rind and blend well. In another bowl combine flours and baking powder; stir in the liquid mixture just until blended. Stir in carrots and apples; spoon into paper lined muffin tins. Bake at 435F degrees for 15 to 20 minutes; cool 5 minutes before removing from pan. Combine both flours, baking powder and salt; set aside. Beat eggs in a large bowl until light colored and thick; beat in honey, milk, butter and orange peel. Add carrots and apricots to bowl and blend in; stir in flour mixture just until moistened. Divide batter between 2 prepared cans; cover cans with foil and SECURE top by tying string around the top. Place a trivet on bottom of a large pan; place cans on trivet and fill half way up the cans with boiling water. Cover pan with lid and let cans SIMMER for 3 hours. Remove tops from cans and place in oven for 10 minutes; cool 10 minutes in cans and remove from cans. Preheat oven to 375F degrees; grease loaf pan. Sift together all flours, cornmeal, baking powder and powdered milk; stir in wheat germ. Cream butter with honey and molasses in a mixing bowl; beat in eggs. Combine water and carrots; add to creamed mixture alternately with dry ingredients. Add seeds and nuts and blend well; pour into prepared loaf pan. Bake 50 to 60 minutes; cool 10 minutes and then remove from pan.